MAYOR Tony Wellington has revealed he has been working for a year to have West Cooroy State Forest transferred into national park in order to protect threatened koalas. He raised this goal in citing shortcomings of a shire biodiversity assessment report prepared by a consultant and moved to have koala plight in this area specifically mentioned in the motion to adopt the report. Cr Wellington also wanted the report corrected where it said Noosa has the only substantial coastal are of mainland remnant vegetation between Byron Bay and Bundaberg. "I find that an overreach given that the bulk of the Cooloola section of the Great Sandy National Park is actually in Gympie Shire and not in Noosa," he at Monday's general committee meeting. He was also critical of the failure of the report to table "large number of threatened and important species". "The West Cooroy State Forest has nothing mentioned next to it and I'm suggesting it really should have koalas," he said. 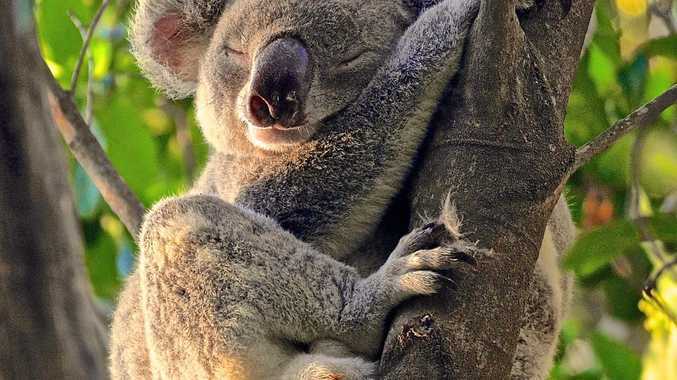 "Our work with the USC (University of the Sunshine Coast) sniffer dogs found koala scats all around that area and we've got good verification from locals that there are plenty of koalas in there. "The reason this is important to me is that I've been working over the last year to get West Cooroy State Forest transferred into national park for the protection of koalas there. The mayor said this was an ongoing process measuring biodiversity values to help base evidence based intentions of the shire. "We all know that our intention is to improve not just maintain current biodiversity," Cr Wellington said. Cr Frank Pardon said at least the council "has a benchmarking tool here". "We find we're holding a pretty good line, but in the future going forward we'll be able to actually improve again, by actually increasing corridors and purchasing more land along these corridors to get that connectivity." "Once we know what's there, and that's what this is about, then we can look at the various protections options we have working with the state." Cr Ingrid Jackson said this was a great way to feed into an overarching environmental strategy. According to Cr Brian Stockwell, this was a good starting point "and from there we build on it" and council was working with local groups to tap into their local knowledge. He said there was "huge amounts of technical expertise in our community" that will have hands on that may not be in "the George St data bases" .